Here's where to watch every episode of The Legend of Tarzan season 1. Mouseover or tap an episode to see where to stream it. Click or tap the play icon to stream it on the best available service. Tarzan and the Race Against Time Sep 3, 2001 Tarzan is bitten by a poisonous spider and the gang must go to the top of the waterfall to find the antidote. Meanwhile, Terk is having a hard time getting used to Jane. Tarzan and the Trading Post Sep 4, 2001 A trade manager named Renard Dumont makes his trading post where the rhino herd is, causing them to move into gorilla territories. Will the gorillas have to move? Tarzan and the Lost Cub Sep 5, 2001 Jane finds a lost leopard cub and decides to keep it, but all know that Tarzan won't like having a leopard around. Tarzan and the Lost City of Opar Sep 6, 2001 Two leopard-men take the Professor to the forgotten city of Opar, where Queen La is hoping for a king. She refuses the Professor and has the leopard-men to do what they wish with him. Meanwhile, Tarzan learn about men and woman in England and keeps on insisting that ""Jane is the best"". When they find out about the Professor, they all head for Opar, just in time to save the Professor. And when La sees Tarzan she falls head over heals in love and plans to get rid of Jane! Tarzan and the Rogue Elephant Sep 9, 2001 Baruti and Jamila, an elephant couple, migrate into Tantor's herd to protect their hypochondriac son, Jabari (who bears an uncanny resemblance to the young Tantor), from the mad rampages of Mbaya, an elephant gone ""rogue"". Tantor and Jabari instantly bond, but, through a series of coincidences (including Jabari's insistence that African violets -- which Tantor's eaten for years -- are the dietary root of rogue behavior), Tantor comes to believe that he's responsible for Mbaya's recent rampage through Tarzan's protectorate (which he's somehow managed to sleep through) and retreats into the jungle. Meanwhile, Jane attempts to discover something that Tarzan's afraid of. Tarzan and the Poisoned River - Part One Sep 10, 2001 Tantor drinks some water from the river and gets ill. While Terk tries to save Tantor, Tarzan, Jane, and Archimedes try to go upstream to find out just what's poisoning the river. Along the way, they loose their boat and later get captured by a group of natives who think they are the ones who poisoned the river. Tarzan and the Enemy Within Sep 12, 2001 Tarzan and Terk find an injured gorilla named Gobu in the forest. Little do they know, but he is under orders from his leader to lure Tarzan back to Gobu's family. Once the injured gorilla (who Terk has taken a strong shine to) is better, he and Tarzan embark on the long journey to Gobu's home, only to find the evil Tublat, a bull ape who was expelled from Kerchak's family many years before, was waiting there to trap him. Meanwhile, Jane and Professor Porter attempt to teach Terk to be more lady-like. Tarzan and the Fountain Sep 13, 2001 The Professor eagerly awaits the arrival of a Professor Doyle. Upon arrival, all are surprised to find that he's... a she? Professor Robin Doyle had come to Africa to study Keewazi's tribe with the Professor. While they study, they find some of the older men to have quite startling ages (from 500 to 700), and learn about a great fountain. Professor, who feels he's too old for Robin (he likes her), secretly sets forth to find this fountain. Tarzan and the Hidden World Sep 14, 2001 When the Professor's rival, Samuel T. Philander, visits Africa, he must come up with something spectacular to become famous on before Philander. That's when Tarzan tells them about Pellucidar, an underground world where dinosaurs live. But Philander follows them there and takes pictures. Little does he know that they have been wasted by a curious little baboon. Tarzan and the Rift Sep 16, 2001 Poachers arrive in the jungle and are setting traps everywhere, so Tarzan warns everyone to be careful. Meanwhile, Terk encourages Tantor to act on his attractions to a female elephant named Dania with a talent for singing. The first date goes well, and though everybody finds Dania perfectly charming, she herself gets off on the wrong foot with Terk. When Tark discovers Tantor would rather spend his time with Dania than her, she plans to break them up, but things don't go too well. Terk is caught in one of the poachers traps and put in a cage. Now Tantor must decide which is more important to him - his relationship with the difficult Dania, or saving his best friend from being kidnapped. Tarzan and the Giant Beetles Sep 17, 2001 When Terk and Tantor accidentally spill some of the fluid from the giant flowers the Professor was studying onto a few beetles, it makes them giant themselves. To stay out of trouble, they keep it a secret. But how can you keep a couple of huge beetles a secret? Tarzan and the Jungle Madness Sep 18, 2001 Tarzan and Jane return from a trip to the Waziri village (on a ""Jungle Cruise""-style steamer piloted by Hugo and Hooft) to find the Professor missing and his camp in ruin. Jane momentarily fears the worse, but soldiers on with Tarzan in an attempt to determine her father's whereabouts and condition -- a pursuit impeded by the hordes of apparently mad animals (among them, Terk and Tantor) destroying everything in their path and pleading for the cessation of a mysterious, unheard ringing. Tarzan and the Protege Sep 19, 2001 Dr. Robin Doyle returns to the jungle with her nephew Ian, a bookish child with few friends who spends his time collecting butterflies. While Robin and the Professor spend some quality time ""spooning"", the task of entertaining Ian falls to Tarzan, whom Ian sees as a much-needed role model. Lacking any other experience, Tarzan fills the day with activities he enjoyed as a child, and it's not long before the boy's discarded his formal trappings for a loincloth. None of this sits quite well with Jane, though, who worries about the dangers of a small child swinging recklessly from tree to tree -- and what the good doctor will say when she finds out. Tarzan and the Rough Rider Sep 21, 2001 Tarzan and his jungle are visited by former President Teddy Roosevelt and, while on the hunt for animal specimens to study (which of course Tarzan heavily disapproves of), both are kidnapped by conspirators. In the process of escape, Tarzan teaches the President the importance of respecting nature, and he gains a new appreciation for it by the time he leaves, promising to bring that lesson home to America. Tarzan and the Seeds of Destruction Sep 23, 2001 Disgusted by the decay near the elephant territory, Jane tries to use an English vine to cover up the scent. But the vines cover up everything and are too poisonous to eat. While Jane and the Professor try to think of a solution, Tarzan invites the elephants to live with the gorillas, but how long can they live together in harmony? Tarzan and the Silver Ape Sep 24, 2001 The Professor learns about a spiritual silver ape that, supposedly, cures the injured of the jungle. Not believing this is a spiritual creature, he plans to study it more. But when Philander steals his notes and finds out about the ape, he plans to capture it. Tarzan and the Challenger Sep 25, 2001 Tarzan's leadership of the gorilla family is challenged by a young silverback male named Moyo, who says that if Tarzan were forced to choose between caring for Jane and caring for the gorillas, he would choose Jane. Moyo wins leadership only when Tarzan sacrifices his in the fight in order to save Moyo's life. The new leader leaves with the gorillas to escape the threat of Histah, a giant python that used to terrorize the gorillas when Kala was young. Tarzan and Jane remain at the treehouse, and Jane tells Tarzan that she understands how Tarzan misses his family, as she misses them too.Suddenly a baby gorilla named Bibi returns to Tarzan with a message that the gorillas are in trouble. Tarzan and Jane follow and find the family trapped in a tar pit, and at the mercy of the giant snake Histah. 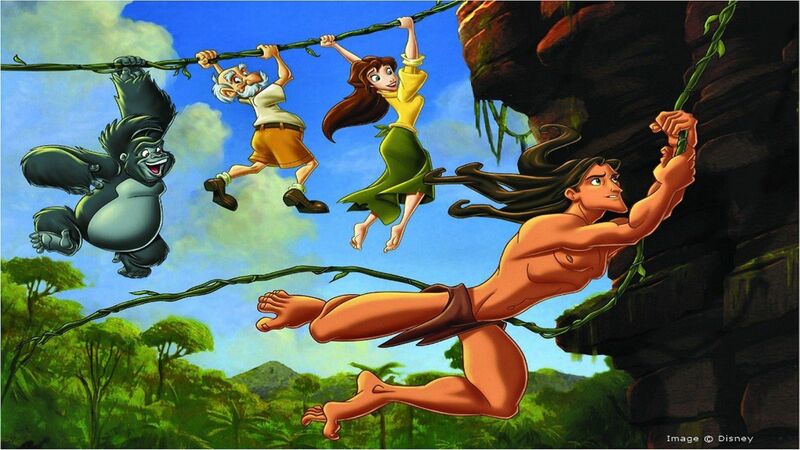 Tarzan begins to help Moyo and the gorillas out of the pit, but Histah chases Jane and when Tarzan hears her screams he is torn between saving the family and saving Jane. Tarzan and the Outbreak Sep 26, 2001 A logger who cuts down trees only for the money gets a dangerous disease. Not only him, but his only child and friends, also. Tarzan nurses and does whatever he can for them, despite the logger the logger being unkind to Tarzan's home. Tarzan and the Silver Screen Sep 27, 2001 While playing hide-and-seek, Terk and Tantor spy a band of hunters and rush the news to Tarzan and Jane, who are reading ""Frankenstein"", and learning the word ""fiction"". These ""hunters"" turn out to be an early 20th century film crew, filming a movie (""Savage Man"") about a jungle man similar to the Tarzan of popular culture. The movie, a silent picture, stars Stanley Obrowski (the quintessential 'stuffed shirt' actor) and Naomi Madison (a silent movie actress Ã la Clara Bow or an early Mae West with a Brooklyn accent) as his leading lady. Misunderstanding the fictional nature of the movie, Tarzan ""saves"" Naomi from a staged peril, and is hired by Tom Orman (the film's astounded director) as stunt man and, later, star, due to the jealous Stanley's temperament and ineptitude. His pride wounded, an irate Stanley decides to sabotage the movie by setting fire to the film itself -- but the film is highly flammable, and the trading post is soon ablaze around him! Tarzan and the Beast From Below Sep 28, 2001 Terk gains an appreciation for Tantor's phobias when a velociraptor (loose from Pellucidar) scares her silly. Tarzan and the All-Seeing Elephant Sep 30, 2001 Tantor freaks out over bees and runs (and bounces) about until he ends up in the same pool where little Jabari and his mother are drinking water. Then Jabari says that it was the ""All Seeing Elephant"" on Mount Indigo that saved Tantor from near death. Tantor doesn't know what to think, so he goes back to base camp to ask Tarzan, Jane, and Porter whether or not they'd ever heard of the ""All Seeing Elephant."" They all tell him no, but say that it's an interesting idea, though probably not true. Then Tantor accidentally leans on Porter's experimentation table, causing the chemicals to explode, and another near-death experience for Tantor. Tantor then attributes his safety to the ""All Seeing Elephant"" and decides to go on a quest to Mount Indigo to meet him. For Tantor's safety, Tarzan, Jane, Porter, and Terk reluctantly follow. Will Tantor find his ""All-Seeing Elephant""? Tarzan and the Lost Treasure Oct 2, 2001 Count Nikolas Rokoff hears about a treasure in the valley of the leopards and plans to find it. Tarzan doesn't want to help... until Nikolas threatens to kill Jane if he doesn't. Tarzan and the Return of La Oct 3, 2001 While the gang is setting up a surprise croquet game for the Professor, Jane encounters an ill-looking fawn. Upon touching the fawn, the soul of--none other than--Queen La enters her body. Failing to return to Opar by herself, La turns to Tarzan, who senses something wrong right away. So, she turns to Dumont for help. Can the aid of Usula, the Waziri elder, bring Jane back before La retrieves her staff and brings Opar to life again? Tarzan and One Punch Mullargan Oct 4, 2001 The arrogant and aggressive heavyweight boxing champion 'One Punch' Mullargan, along with his manager and personal journalist, visit the jungle while on safari. When Tarzan accidentally knocks One Punch out cold (with one punch) the boxer is mortified and demands a 'rematch'. Tarzan refuses, with encouragement from Jane who explains that in the world of men fighting never solves anything, and would probably just make it worse. However, One Punch is stubborn and looks for a way to provoke Tarzan into a fight. Tarzan and the Prison Break Oct 7, 2001 In this episode, Hugo and Hooft use Tarzan to help them gather special ingredients for their hot sauce. The sauce, with the guys' names on the bottle, becomes popular to the French Foreign Legion, and is brought to the attention of Lt. Col. Staquait. Staquait then vows to re-capture Hugo and Hooft for deserting when they did. He hasn't left without a plan, though. Trapping both Hooft, Hugo, and Tarzan in two separate nets, he is able to take them in... to ""Cape of Doom"" prison. Upon attempting to free his friends, Tarzan is captured and locked up, too. Can Jane contact the Magistrate and settle this once and for all? Tarzan and the Eagle's Feather Oct 8, 2001 Tarzan and Jane attend a Waziri wedding (Basuli and his betrothed). Jane is startled at the Waziri custom for the groom to complete a challenge before he is alowed to wed, and she accidentally causes an upset between Basuli's fiance Naoh and Kewazi, the chief. Meanwhile, Tarzan accompanies Basuli on his quest to find an eagle's feather (from a specific eagle), but a lot of accidents happen along the way. Basuli claims that fate is against them, but Tarzan suspects sabotage. So while they are fighting their way to the eagle's mountain, Jane is back at the village trying to patch things up between Naoh and the chief. The story is basically about the importace of tradition vs. the importance of one's personal values, morals and desires. Tarzan and the Face from the Past Oct 9, 2001 Zutho, a shady mandrill from Tarzan's past, resurfaces, demanding a favor he claims owed for keeping a 20-year-old secret. Much of this episode takes place in flashback as Terk relates to Jane the events that allowed Zutho (and cohorts Gozan and [???]) to gain such a hold over the lord of the jungle. Tarzan and the Gauntlet of Vengeance Oct 11, 2001 Clayton's sister (or rather her valet, Hobson) kidnaps Jane, Tantor, Terk, and the Professor, placing each in a separate, deadly peril. She then injects Tarzan with a fatal poison (via blowdart) and informs him that the antidote lies far away on a distant mountain she's dubbed ""Clayton's Peak"". He, therefore, has a choice, she says -- to suffer as she had (and lose those he loves) or as Clayton had (and lose his own life).